As FCR pitches Chinese investors seeking green cards, ESDC admits EB-5 arena funds not needed; is this legit if money's supposed to create jobs? Nearly 500 Chinese millionaires, hoping for green cards and starry-eyed at the thought of pro basketball, may hold the key to developer Forest City Ratner's (FCR) progress with the Atlantic Yards project. Potential investors have been attending investment seminars in China like the one October 19 (promoted below); such sessions continue through December 19. However, as detailed below, the effort to raise $249 million tests the spirit and perhaps the letter of an obscure but newly popular federal law that grants fast-track green cards in exchange for job-creating investments. Rather than use investors' money as seed money or matching funds, as in some other EB-5 projects, it seems that Forest City Ratner would in large part simply be trading higher-cost financing for a no-interest loan. Thus, it wouldn't create new jobs, even if it may fit within the loose strictures of the federal law, in which the total sum of money must generate 4980 jobs, ten per investor. Should such tactics-- essentially endorsed by the state, city, and Borough President, who have joined in project promotion--pass muster, they invite an absurd process: any developer might save hundreds of millions of dollars, substituting cheaper capital for existing capital, claiming it creates jobs because it's tied to a project with existing, committed investment. That would help monopolize a limited federal resource--visas for job creation--while skirting the goals of the immigration program. The "Brooklyn Arena and Infrastructure Project," a $1.448 billion subset--the arena, plus infrastructure and a new railyard--of the $4.9 billion Atlantic Yards project, has never been approved by any official body nor previously announced before the effort to solicit immigrant investors. It is apparently formulated to generate--at least on paper--the necessary number of jobs. And the public officials promoting the effort may be helping Forest City Ratner above all else. 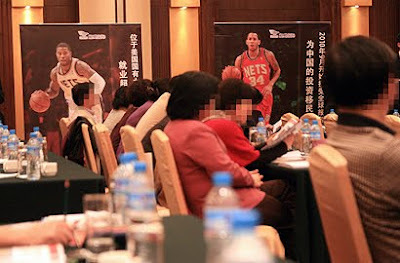 In China, in promotional videos (excerpted below) and webcasts produced by immigration consultants working with the privately-run New York City Regional Center (NYCRC), the game features FCR officials, retired players, upscale signifiers like cascading champagne, and basketball-related raffles. 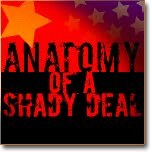 As with some other shady deals, this takes place on a frontier, involving a little-scrutinized program, a language barrier, and a minimum of transparency. It's a magical moment of international arbitrage, as slick marketing and basketball fever aim to sell investors on their green card dreams, perhaps distracting them from due diligence. "It is the safest, most secure, highest job-creating EB-5 project on the market today," the NYCRC's Gregg Hayden declared confidently (at 5:33 of this excerpt) during a Q&A webcast broadcast in China in October, "and you will have an easy path to your permanent residence status in the United States." Hayden appears to be a spiritual cousin of Nets' chief salesman Brett Yormark, concerned less about facts than getting the deal done. As noted, the arena is presented as the prime investment opportunity, such as in the project brochure (right). But the arena is already funded, as is the associated arena infrastructure, which casts doubt on the rationale for recruiting immigrant investors. There's no proof the investment is needed to create jobs. Only one element of the three-element "Brooklyn Arena and Infrastructure Project" is not yet funded: the railyard, which need not begin until 2012. The NYCRC assures potential investors they face no risk in getting green cards, a federal government spokeswoman says that's not so, as I detail below. Three, while the NYCRC is a private company, authorized by the federal government to gather immigrant investor funds, the brochure and other public statements suggest that the city and state of New York, as well as the NBA, are partners in the Brooklyn Arena and Infrastructure Project. There's a logic to the pitch, however misleading. Only by aggregating the $249 million sought with existing funding--from government agencies and private investors--can the risk to immigrant investors be portrayed as minimal. And only by lumping that $249 million with existing funding might the overall "investment," under federal law, be large enough to generate sufficient jobs for green cards. The permitted formula calculates jobs via an economist's report on total project spending, coming up with an surprising 7696 jobs based on the $1.448 billion invested. That number of jobs far exceeds the 2009 official estimate by the Empire State Development Corporation (ESDC) for the entire $4.9 billion project: 4227 jobs annually in the state over the period of construction and 30 years of operation, and 25,133 total job-years in construction, which, at a now-implausible best-case scenario of ten years, would be 2513 jobs a year. Beyond the differences in calculating jobs, as I describe below, there's reason in this case for doubt. "The project itself involves three components," Hayden said (at 1:33) in a webcast, excerpted below. "The Brooklyn arena; the related infrastructure to the lands; and the redevelopment and expansion and upgrading of the [city's] third largest transportation hub, in Brooklyn, called the Atlantic Terminal." Put aside Hayden's overblown depiction of a new railyard, to store and service trains, as "the redevelopment and expansion" of the transportation hub. After all, the new railyard would be smaller than its predecessor, though modernized. Consider his emphasis on the arena, and whether the funding's really needed. The narrator of an project video shown to potential investors states solemnly, "The cornerstone of the project is the construction of the Barclays Center, New York City's newest sports and entertainment arena." Is it? "There are sufficient funds committed to complete the arena and related improvements with or without EB-5 funds," acknowledged ESDC spokeswoman Elizabeth Mitchell last week in response to my query. The ESDC both shepherds and oversees the Atlantic Yards project. That contrasts with Mitchell's explanation in October regarding ESDC Executive Director Peter Davidson's trip to China, along with NYCRC and FCR officials, to help promote the project: "To that end, ESDC is committed to assisting our private partners secure the financing they need to ensure the project’s completion." In other words, when the ESDC paid for Davidson's trip in October, he was there less to ensure the completion of the Atlantic Yards project than to save developer Forest City Ratner money. By contrast, in a reference to the federal guidelines that allow calculation of jobs based on total money spent, Hayden in the webcast above (at 2:48) cited "the abundant job creation that we are producing with this project." What if the EB-5 money weren't available? Mitchell told the Daily News that "Forest City Ratner will need to raise funds from other sources to facilitate build-out of the entire project." That couldn't have been a reference to the arena and associated infrastructure; more likely she was referring to the third component, the not-yet-funded railyard, which at a later date would require a deck for construction over it. 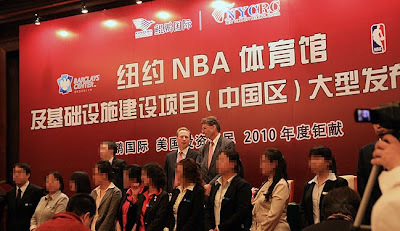 Davidson appears along with NYCRC officials, FCR officials, and others, in the video below, excerpted from a webcast in China. 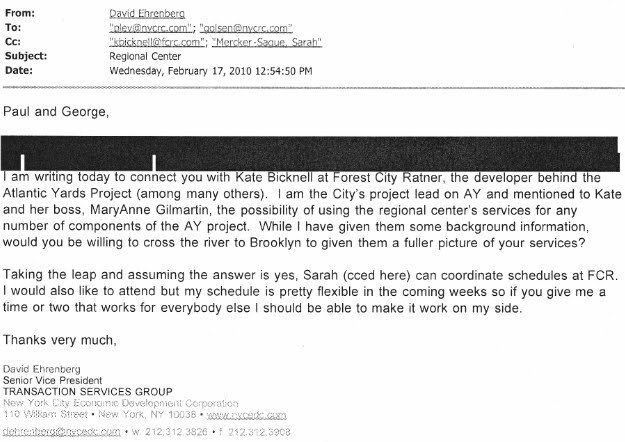 The ESDC wasn't the only government agency trying to help Forest City Ratner. New York City officials have backed the project, with Mayor Mike Bloomberg appearing in a promotional video shown to potential investors. So too has Brooklyn Borough President Marty Markowitz. However, those officials' statements presented to the potential investors were misleading. They stressed the job-creating value of the overall $4.9 billion Atlantic Yards project. But investors instead are being offered the smaller, $1.448 billion "Brooklyn Arena and Infrastructure Project," involving funding for the arena, infrastructure, and a new railyard. Compounding reasons for concern, the main players in the project, including FCR, the NYCRC, and its lawyers, won't answer my questions. Nor are underlying documents required to be made public. So we don't know, for example, how the jobs are calculated. The ESDC has offered limited responses, suggesting that questions should be posed to FCR and the NYCRC. 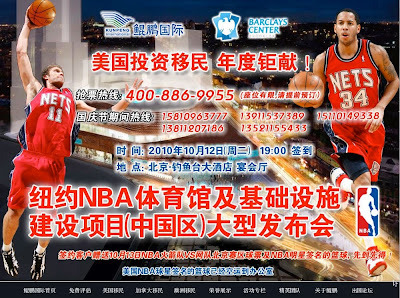 The NYCRC, while promoting the arena project energetically in China, does not even name the project on its web site, instead promoting only a project at the Brooklyn Navy Yard. Before drilling down into the pitch to investors, here's some background at the EB-5 program, founded two decades ago in response to successful efforts by Canada and other countries to lure wealthy individuals. Initially, immigrant investors were to create ten jobs directly with $1 million in investment. Now only $500,000 is required in Targeted Employment Areas (TEAs), zones that are rural or have high unemployment. Brooklyn qualifies as a TEA. More importantly, the EB-5 program, overseen by the United States Citizenship and Immigration Services (USCIS), has evolved. Investors in regional centers, USCIS-approved private companies (or, in the case of Vermont, a public agency) that serve as investment pools, need not prove direct job creation. Of 10,000 EB-5 visas a year, 3000 are reserved for regional center-based investments, according to the trade group IIUSA. Rather, those investors can submit an economist's report that calculates direct, indirect, and induced jobs by applying a multiplier to the total money invested. While there's a logic to the process, in this case one lingering question is whether the immigrant investors deserve credit for job creation from a "project" that would proceed without them. The story of the "Brooklyn Arena and Infrastructure Project"--a name new to those of us following the Atlantic Yards project in New York--emerged in late September, as I pieced together details from websites regarding EB-5. The plan dovetails with a statement Forest City Enterprises Executive VP Bob O’Brien made in a 9/13/10 conference call with investment analysts: “At the end of the day, it’s all about the cost of the capital. And if we can do it at a reasonable, affordable cost, we’ll do so." [Forest City Ratner executive MaryAnne] Gilmartin said she expects much of the money raised through the program would go toward financing the construction of a new rail yard for the Long Island Rail Road to replace the one that occupied a large portion of the site. Some may also be used to help pay off land loans on the project, she said. In October, Gilmartin, Ratner, and other Forest City executives went on a week-long, multi-city tour of China, accompanied by the ESDC's Davidson, retired players like Dawkins, NYCRC executives, and lawyers from the NYCRC's preferred law firm, the Ithaca-based Miller Mayer. Brooklyn Borough President Marty Markowitz, also invited by the NYCRC, announced his plan to go, but backed out after scrutiny emerged in this blog and in the New York Post. In September, the NYCRC's George Olsen told the Wall Street Journal the financing could take at least six months to round up. The USCIS must examine each of the potential investors as well as the project being funded before awarding a conditional green card. Two years later, the conditions can be removed if sufficient job creation is shown. The investors, however, might not get their investment back for seven years, as noted in Part 1 of this series. The Brooklyn project emerges in a watershed era for the EB-5 program, which, as one EB-5 expert puts it, is the fastest and easiest way to immigrate to the United States. The "Brooklyn Arena and Infrastructure Project" is among the largest projects under the EB-5 program, which began about 20 years ago. The payoffs are big; not only might FCR save at least $191 million, the NYCRC and its Chinese immigration consultancy partners would share in project issue fees nearing $19 million. The number of regional centers has soared in the past two years, as real estate developers and others seeking cheap financing, along with some savvy immigration attorneys, have decided to target foreign millionaires more interested in green cards than any investment return. As of December 2008, there were only 32 such regional centers. As of June 2009, there were nearly 50. However, as of October 2010, according to a USCIS presentation, there were 114 approved regional centers, with 83 additional regional center proposals pending as well as 11 amendments to existing regional centers, allowing them to expand their ambit. Federal immigration overseers are finally recognizing the potential for chicanery, as described below. So too has the Chinese government. China--a huge country with a large population of wealthy potential investors--has become the preferred territory for immigration brokers working with U.S. businesses seeking EB-5 financing. What's the governmental role here? The city and state play a tangential role in the EB-5 project, though the NYCRC reps have left a different impression. The city does look favorably on such projects. "We have to look for ways to do more with less," Robert Lieber, then deputy mayor for economic development, told the 5/10/10 Wall Street Journal, regarding the NYCRC's first project, involving the Brooklyn Navy Yard. "This is a real interesting and clever way to provide financing." The Journal 9/21/ 10 reported that city officials, pleased with the Navy Yard project, urged FCR to similarly seek EB-5 financing. 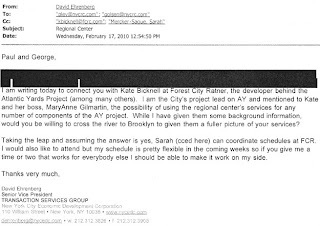 Indeed, a document (left) received under a Freedom of Information Law request shows that, on 2/17/10, the New York City Economic Development Corporation (NYC EDC) proposed that the NYCRC and Forest City Ratner meet to discuss a collaboration. However, the NYCRC portrays the "Brooklyn Arena and Infrastructure Project" as funded, in part, by city and state contributions and suggests government agencies are partners in the job-creation effort. The page below left from the project brochure is headed "Government Support" (according to a translation I commissioned), with the first line stating, "Different levels of government agencies have already approved the key components of the project." However, that refers to the overall Atlantic Yards project, given that the "Brooklyn Arena and Infrastructure Project" did not exist at the time. 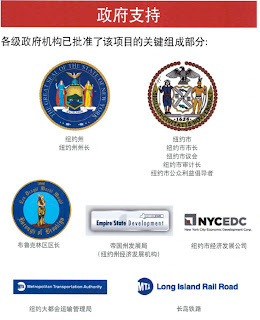 Neither the city nor state government is a formal partner with the NYCRC in the project as presented to the Chinese investors. Each has made previously-funded subsidy commitments. 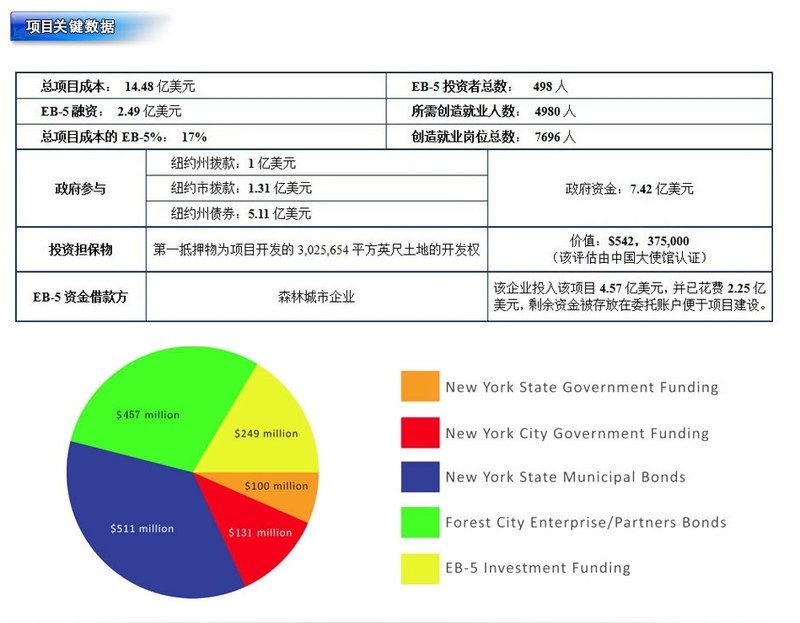 In an NYCRC project video presented in China to potential investors, the narrator states, "The New York City Regional Center is pleased to offer EB-5 investors another secure, job-creating project in conjunction with the government of both the state of New York and the city of New York." The term "in conjunction with" is vague, though it could leave the impression of a formal partnership. Similarly, in the opening of an EB-5 event in Beijing, as shown on this video, Hayden saluted Chinese partners by saying, "For the State of New York, for the City of New York, and on behalf of all of us in New York, we appreciate your strong efforts." That also could leave the impression of partnership. Later in that event, he said, "As you saw in the [official project] video, we have very generous support from the governmental agencies of New York City and New York State; specifically, in the video, you heard [Mayor] Michael Bloomberg talk about job creation and how important it is to New York City." However, government agencies have not invested in the regional center, and Bloomberg was talking about job creation for the Atlantic Yards project as a whole. Hayden also said, “You see that there's 249 million dollars coming from EB-5 investors, which represents only 17 percent of this project; 131 million from New York City; 100 million from New York State; 511 million dollars from a bond offering by New York State; and 457 million dollars from Forest City Enterprises, cash. All of this money, besides the EB-5 investment, is supporting your immigration program." Of course, none of that money was committed with any public recognition that it was to support a future immigrant investor project. Indeed, as I've pointed out, FCE has more than $467 million in cash and credit capacity, according to its 9/8/10 earnings release. Why does it seek a no-interest loan? To increase its bottom line. While the city and state certainly cooperate with Forest City Ratner on Atlantic Yards as a whole, they're not formal partners in the immigrant investor project. The ESDC is not an investor in the regional center. The only relationship the ESDC has to the Brooklyn Arena and Infrastructure Project is its recognition of a first mortgage on project development rights offered as collateral, spokeswoman Mitchell confirmed. NYC EDC spokesman Dave Lombino, when queried, said the city's only formal relationship with the NYCRC is a finder's fee: "There is nationwide shortage of private financing and we’re eager to help economic development projects move forward across the City, including Atlantic Yards, by assisting them in obtaining alternative means of project financing--in this case from abroad. As is typical in these transactions around the country, NYC EDC has an agreement with the Regional Center that would provide us with a finder’s fee for projects that we refer that ultimately are financed through their program." In China, potential investors have been told not to worry about getting a conditional green card--the product of a form, known as I-526. "The first major advantage is that the approval process, from USCIS, having already been accomplished, takes all of the immigration risk out of the process for the EB-5 investor," Hayden (right) claimed in a webcast (below) at 1:00. "[O]ur job creation, which is the focus of getting the condition removed in two years, is so extremely certain with this approval process from USCIS," he continued, at 4:25. 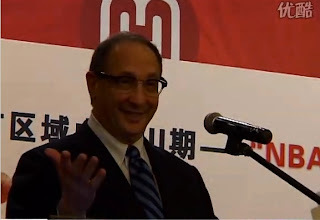 "The most important feature and benefit to you and your family in this project is the fact that this project has been completely pre-approved by USCIS for the benefit of you and your family," he said at a Beijing event, recorded for me by Tom Spender. "This means that all components of this project, all the documents related to this project, have been pre-approved by USCIS, eliminating the immigration risk in your I-526 process, to your benefit and your family's benefit in immigrating to the United States. This is a very significant, unusual step and an exception for EB-5 and EB-5 in the China market to have this level of approval." "All significant documents that you may sign are also approved, including the escrow agreement, subscription agreement, operating agreement," he added. "And, more significantly, all loan agreements are approved by USCIS." Hayden overstated the certainty of the process, according to the USCIS. In a written request filed August 12, 2010, New York City Regional Center, LLC, sought to amend its initial Regional Center designation to include an exemplar I-526, business plan, economic impact report and sample organizational documents for the Atlantic Yards Project (Atlantic Yards Land Use Improvement and Civic Project) in Brooklyn, New York. More importantly, according to USCIS, Hayden was incorrect. I queried the USCIS: "Can the acceptance of a regional center amendment [and supporting documents] mean that 'this project has been completely pre-approved by USCIS' or that the immigration risk in the I-526 process has been eliminated?" USCIS spokeswoman Luz Irazabal responded: “When we approve a regional center, or we approve an amendment to it, if it’s specific to that regional center, it does not mean that the petitions that are going to be filed have been pre-approved. A regional center may be approved, but at the time an I-526, I-485 or I-829 attached to the regional center is filed, it will be approved based on its merits, and based on a case by case analysis. Requests for immigration benefits (I-526, I-829, etc.) are either approved or denied. At times, USCIS may request additional evidence before making a determination." Can a project be “completely pre-approved by USCIS?" I asked, quoting the precise language that the NYCRC's Hayden has used in China. Irazabal, who cautioned that she could not comment on specific projects, responded, “USCIS either approves or denies a benefit. You’re either a U.S. citizen or you’re not. We don’t pre-adjudicate benefits." Miller Mayer recently assisted the New York City Regional Center in obtaining United States Citizenship Immigration Services (USCIS) project pre-approval for the $249 million Brooklyn Arena/Atlantic Yards Project…. USCIS’s approval of the project should facilitate more expeditious and predictable I-526 processing for EB-5 investors in this project. The only way to know if the USCIS has reviewed and approved the actual project you are considering investing in is to insure an investor has already had an approved I-526 petition on that exact project. That hasn't happened yet with the Brooklyn Arena project, as they're still rounding up investors. Need for a second look by USCIS? The USCIS does operate on the presumption that a project that has passed initial scrutiny does not typically get a second review. The USCIS, for the first time, terminated a regional center, the Victorville Regional Center, CA, as the Victorville Daily Press reported 10/27/10. According to the Notice of Intent to Terminate, the regional center ran afoul of guidelines that require that its promotional activities "accurately reflect current facts regarding the scope, nature, terms and conditions of capital investment opportunities available for EB-5 capital investments affiliated with the regional center." In the case of Victorville, defunct projects were still represented by the regional center as viable projects for EB-5 investments. With Atlantic Yards, unlike Victorville, the "project" marketed by the regional center isn't defunct. However, it arguably does not "accurately reflect current facts." Investors are sought to contribute to an arena that's already funded. Should that be considered job-creating investment? Though the city, state, and private funds already in the Brooklyn arena project were not distributed through the regional center, the USCIS suggests that regional centers should be the conduit for a significant amount of capital. A regional center, according to the letter NYCRC received from the USCIS, noted above, is required to detail not only how it "received alien investors' capital" but also how it "received non-EB-5 domestic capital that has been combined and invested together." At 4:45 of this Q&A webcast in China, Hayden asserted, "All of the funds, with the exception of the EB-5 funds, are in dedicated accounts, and the methodology, RIMS II, that we're using, is approved by USCIS for this project. Because of that, the expenditure budget for the whole project--we will spend the money, they get their jobs. That's all we have to demonstrate." But the regional center itself hasn't received or spent any of the non-EB-5 domestic capital. As noted, the arena was fully funded before the application was even made. Hayden's statement could leave the impression that the regional center would spend the "expenditure budget for the whole project." It won't. 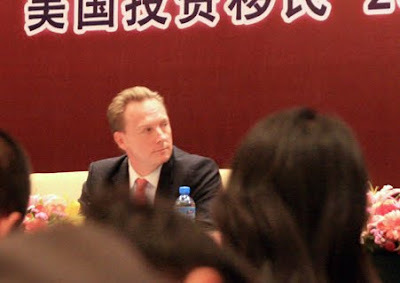 "The level of government involvement and government investment is unmatched in any other project in the EB-5 market today," Hayden asserted at an event for investors in Beijing. The "project," as presented involves a total of $511 million in state bond financing, $457 million in Forest City Enterprises/partners' bonds, $131 million in city funding, $100 million in state funding, and $249 million in EB-5 investment funding, for a total of $1.448 billion. that the EB-5 funding can be combined with total funding to generate a job-creation figure. Is investment "senior-most"? Is it secure? EB-5 investors are most concerned with getting their green cards and, secondarily, getting their investments back. So projects compete on immigration risk (the certainty of green cards) and investment risk (the likelihood they'll get their capital back, coupled perhaps with modest financial returns). "The investor on this particular project, to simplify the process, is not getting paid any interest," the NYCRC's Hayden told The National. "We have put them in such a safe, secure position that they're not earning any interest. If you look at the spectrum of EB-5 projects, interest rates are paid according to risk." "The Brooklyn Arena and Infrastructure Project, your EB-5 investment program, is a $1.4 billion project," Hayden said at 2:58 of this webcast. "It involves a lot of government, over $740 million of government-related funding. The EB-5 funding, the $249 million we are seeking to raise in the China market, is only 17%, the safest, most secure portion of the capital structure, 17%... portion of the capital structure is the EB-5 portion." More importantly, it's a stretch to suggest, as Hayden has said (at 2:05 of this video), that the $249 million in EB-5 funds represents "a senior-most portion... of the capital structure." After all, investors in the tax-free bonds would get repaid first. Those bonds were presented to rating agencies, with the rating based on expected cash flows from the arena. No rating for the EB-5 debt has been announced, nor is it apparently secured by any specific cash flows. Rather, the collateral offered involves a mortgage on development rights to seven future towers on the development site. It doesn't mean they'd jump the line ahead of bondholders to be repaid out of arena revenues, naming rights, and sponsorships. Instead, the focus is on basketball. Hayden at 6:10 in this video, asserted, "The governmental agencies that we involve, which are many, help to provide safety and security to the investor in two forms. We attract and structure our deals in a very consistent template, where the government owns the land and the government agency, or a related government agency, invests many, many dollars in capital, additional capital to create economic activity, in support of the EB-5 investor, and that creates many more jobs, supporting the EB-5 investor program, for the investor client." That all happened before EB-5 was ever considered. CMB structures its investment opportunities with governmental agencies. The funds are invested within those agencies; therefore the government agencies are the responsible party to repay the investment. Even if the investment is made with a private entity (Master Base Developer) the loan will be backed by a government security such as Mello-Roos bonds. How would money be spent? Public statements made by Brooklyn project principals present a confusing account of where the money would go. According to Gilmartin's statement to the Wall Street Journal, the $249 million raised from immigrant investors would go to the railyard and perhaps help pay off a land loan. The railyard should cost $147 million. The developer's land loan from Gramercy Capital was last reported to be $161.9 million. That totals nearly $309 million. Given that construction of the railyard need not begin until summer 2012, I suspect that Forest City might use most of the $249 million to retire what's left of that loan, then apply the rest to ongoing elements of the project. "FCR does have a certain amount of flexibility as to how they finance various elements of the project," the ESDC's Mitchell stated. "Since the loan agreement is between FCR and the Regional Center, I advise you to address use of funds questions with FCR." What might the other elements be? The NYCRC's project video describes the "project": "The Brooklyn Arena and Infrastructure project includes three primary components, the Barclays Center arena, the Long Island Rail Road trainyard, and various infrastructure." The latter includes demolitions, utililty work, paving of a surface parking lot, and the replacement of the Carlton Avenue Bridge. Beyond Mitchell's statement, documentation shows that the arena and the infrastructure, the first and third parts of the "project," are already funded. For the last six months, the firm Merritt & Harris, "Consultants to the Real Estate Lending and Investment Community since 1937," has filed reports on the project to FCR, ESDC, and The Bank of New York Mellon, as PILOT Bond Trustee. To the best of the Construction Monitor's knowledge, the Construction Monitor has no reason to believe that the funds needed to achieve Substantial Completion of the [arena] Project will exceed the amounts available under the PILOT Indenture. To the best of the Construction Monitor's knowledge, the Construction Monitor has no reason to believe that the funds needed to achieve Substantial Completion of the Infrastructure Improvements will exceed the amounts available under the Trust Agreement. So, if the money's already there, why are Chinese investors being asked to invest in an arena and infrastructure? Perhaps because it's easier to say that than to explain that they're helping replace temporary financing for such elements at higher interest. According to the Official Statement accompanying the tax-exempt bond issue in December 2009, the "proposed Arena project" would cost $904.3 million, including $807.1 million in direct project costs and $97.2 million in associated infrastructure costs. The arena infrastructure involves "Transit Improvements, the Urban Experience and other site work, and the Fourth Avenue Reconfiguration." Beyond that, Related Infrastructure Improvement Costs (temporary rail yard, utility work, Carlton Avenue Bridge, etc.) were projected to be $195 million, of which $100.5 million as of October 2009 had not been spent. So, how did ArenaCo, FCR's holding company for the arena, this year meet the Vacant Possession Release Conditions--the final delivery of Phase 1 property, after eminent domain and settlement agreements--which would release the tax-exempt bonds? It had to deposit into various accounts approximately $324.8 million for the arena, plus $15 million for the bridge, and additional funds for infrastructure improvements. In December 2009, when the bonds were issued, ArenaCo didn't have the money. Where could it come from? New funding or financing from Russian billionaire Mikhail Prokhorov, related companies, or others. The money's now there, including $75.8 million from Prokhorov, but it might have been expensive. Hence FCR's extensive effort to seek lower-cost money from overseas. While federal law requires only 4980 jobs (ten per investor), NYCRC claims that 7696 jobs would associated with this investment, as seen on this website promoting an October 12 investor event. In documents and public statements, the NYCRC and its agents say the "project" would easily generate well more than the required jobs. 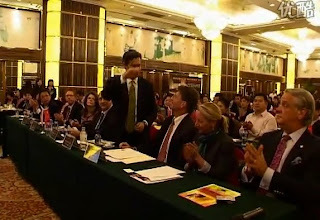 In a video created to persuade investors, NYCRC principal Paul Levinsohn (saluting crowd in screenshot at left) suggested some simple math: "The EB-5 investment is 249 million dollars. The project will have 498 investors. And since each investor of 500,000 dollars must create ten jobs, the total amount of new jobs needed for 498 investors is 4980 jobs. The Brooklyn Arena and Infrastructure project will generate 7696 new jobs. Therefore, the project creates 2716 excess jobs, for a job surplus of 54%." "There are many other EB-5 projects that have speculative job creation. Not this project," Levinsohn declared. "Job creation is secure, because 100% of the government and private capital used to calculate the jobs has either already been spent or already placed in dedicated accounts specifically to fund the project." However, the calculation relies on yoking the new investment with the previous one. Can the NYCRC and FCR succeed with assigning job creation to all the funding contributed to the "project"? In other words, can the immigrant investors, who would contribute $249 million, gain credit for job creation based on the entire $1.448 billion, including funds committed years ago? Federal guidelines are unclear. Remember, actual jobs need not be counted. Rather, an economist's report can suffice. Use of the expenditure model requires knowledge of the amount of capital that will be invested or loaned to, and subsequently spent by, the project. The amount is not restricted to EB-5 capital but may include other sources that will be invested roughly at the same time and for the same purpose. Some EB-5 projects clearly qualify, such as when the immigrant investors' capital served as seed money or helped fund a matching grant. One example: the Mill Street Project of the firm CMB Export. The USCIS does not seem to have examined the issue closely, leading perhaps to a gap in the law. The establishment of a new commercial enterprise may be used as the basis of a petition for classification as an alien entrepreneur even though there are several owners of the enterprise, including persons who are not seeking classification under section 203(b)(5) of the Act and non-natural persons, both foreign and domestic, provided that the source(s) of all capital invested is identified and all invested capital has been derived by lawful means. (2) Employment creation allocation. The total number of full-time positions created for qualifying employees shall be allocated solely to those alien entrepreneurs who have used the establishment of the new commercial enterprise as the basis of a petition on Form I-526. No allocation need be made among persons not seeking classification under section 203(b)(5) of the Act or among non-natural persons, either foreign or domestic. The Service shall recognize any reasonable agreement made among the alien entrepreneurs in regard to the identification and allocation of such qualifying positions. In other words, immigrant investors can be credited for jobs created by the entire investment. But the identification of the jobs must be reasonable. Is it reasonable to credit immigrant investors for job creation based on money taxpayers have already invested and on funding that substitutes for higher-cost capital? I asked USCIS more specifically about a scenario--like the Brooklyn project--in which the EB-5 money was not needed. Could the immigrant investment be credited with creating jobs? I haven't yet gotten an answer. Perhaps the enabling legislation offers guidance. The Immigration and Nationality Act [INA §203(b)(5)(A)(ii)], states that the rationale for the EB-5 program involves immigrants "engaging in a new commercial enterprise...which will benefit the United States economy and create full-time employment…"
The terms "new commercial enterprise" and "will benefit" indicates its prospective nature. The arena and infrastructure were already funded before the NYCRC requested an amendment to include the Atlantic Yards project in its investment portfolio. The non-EB-5 money was not recruited by the NYCRC. It was already there. Perhaps recognizing it would be difficult to present an arena-focused EB-5 investment to local officials, the NYCRC was more measured in its promotion to Brooklyn Borough President Marty Markowitz. 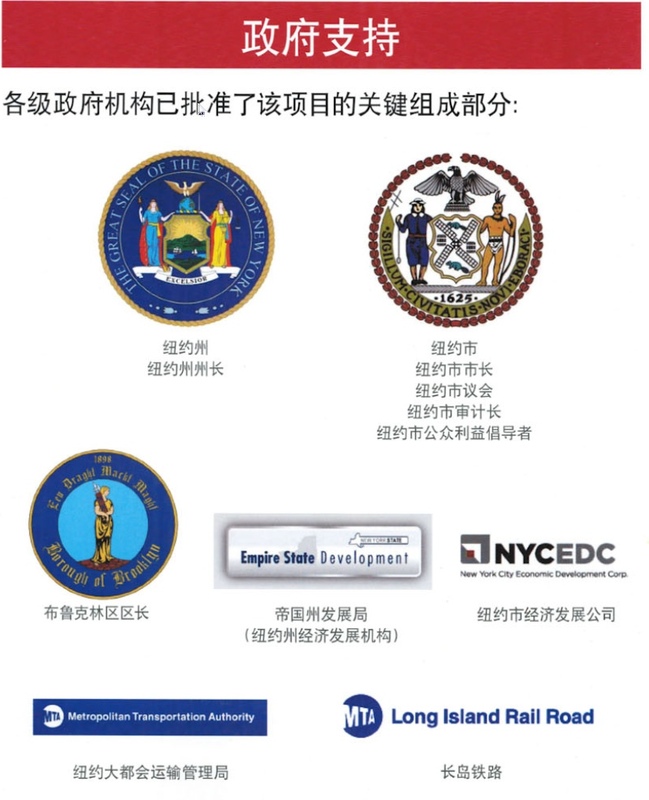 Inviting Markowitz to go to China to promote the project, as noted in the letter below, the NYCRC stated, "The proposed $249 million of EB-5 investment capital will facilitate critical components of the Atlantic Yards Project and is estimated to create over 7,600 jobs for the City of New York." Markowitz backed out of his plan to go, after critical coverage surfaced, but the investment by the NYCRC of $3500 in travel costs would have been quite modest in relation to the firm's potential gains, with a $38,000 issue fee per investor (and unspecified costs). In another effort to convince prospective investors, NYCRC reps have fudged another aspect of the project. "Forest City Enterprises has signed a completion guarantee with the State of New York," said the NYCRC's Levinsohn on the video. "This agreement with the government obligates Forest City to complete key aspects of the project, such as the Barclays Center arena and new subway entrance." This guarantee was memorialized at the master closing, as FCR's Gilmartin said in affidavit last April. Hayden went further in his rhetoric at one session in Beijing. "The strength of Forest City Enterprises allows them to deliver a completion guarantee, as required by the state of New York, to complete this project, to benefit your immigration program in two ways," Hayden declared, according to the recording I heard. "One, the safety and security to know that this project will be completed by the second quarter of 2012," he continued. "And two, this completion guarantee facilitates, in cooperation with all the funds that are on account, the jobs." Remember, the "project" has three components: the arena, infrastructure, and railyard. Only the first two elements are supposed to be completed by 2012. Hayden, in an example of sloppiness or prevarication, conflated two elements of the "project" with the third element. At 5:15 of this webcast, Hayden stated, "If I could just add one more thing, which is very significant for the EB-5 investor. It is that there is a significant completion guarantee, mandated by the state government of New York, that Forest City Enterprises, the developer, provides. This serves two purposes. One, the completion of the project. Forest City Enterprises must complete major components of this project. In doing so, they will spend all of the money budgeted that is on account. That's how certain the job creation is in this project." However, the "major components" subject to the completion guarantee are already funded. Why immigrant investors should get credit for job creation related to those components remains unclear. Hayden did not explain that the railyard must be completed not by 2012 but by September 1, 2016, as stated in a Metropolitan Transportation Authority Staff Summary (excerpt at right) from June 2009. Construction must begin, however, by June 2012. Thus, should Forest City Ratner be successful in raising EB-5 funding by early next year, it wouldn't need that money for the arena and could use it for other purposes. In this case, the NYCRC seems to be pushing the envelope on the relationship between the immigrant investor money in the "project" and other funds. "Many projects in the EB-5 world of money-raising require all the funds, part of the funds, or require the funds from EB-5 in order to begin the project," Hayden said at the Beijing event. "This one does not. It will continue to be completed, with the help of your investment." Such other projects apparently include ones promoted by the NYCRC. At a U.S. Senate hearing 7/22/09, Miller Mayer attorney Stephen Yale-Loehr described three other NYCRC planned projects: one with $60 million from immigrant investors and $58.5 million of government funding; another with $45 million from immigrant investors and $15 million of other funding; and another with $35 million from immigrant investors and $40 million of government funding. The Brooklyn Arena project thus appears to be an outlier, with the immigrant investors' funds not as clearly needed for project progress. In that Beijing presentation, Hayden claimed to investors that the 22-acre Atlantic Yards site "is owned by the state of New York." It's not. Only part of it is owned by the state, given the decision to pursue eminent domain in two or three phrases. Was he fudging for exaggeration or was he merely relying on an erroneous statement in the New York Times published on September 28? Either way, it was just another example of misrepresentation. Though regional centers have until recently faced little oversight, the USCIS recognizes there may be a need for more scrutiny. In an October 14, 2010 quarterly presentation to stakeholders, the agency stated: "Many USCIS External Stakeholders have expressed concerns regarding the potential for fraud and misrepresentation within the EB-5 program." In October, Florida immigration attorney Jose Latour condemned many regional centers--though not by name--for failing to deliver on two separate objectives: generating a sufficient number of jobs, thus guaranteeing investors green cards, and generating sufficient revenue to ensure that the investors would get their money back. How many EB-5 Regional Centers deliver on both fronts? Very few. "Yes, we are not investment advisers, but as immigration counsel we are bound to reasonable care, and it doesn’t take Gordon Gekko to see the obvious scams and failures which characterize the majority of the Regional Center projects being shopped overseas." Note that Latour has not commented on the NYCRC or its projects. However, he has suggested that only in China do potential investors seem susceptible to unrealistic EB-5 programs. Statistics will not tell you the very important implications if most of the applicants are from a particular country, particularly China. It is very important you are made aware of the potential dangers of this. 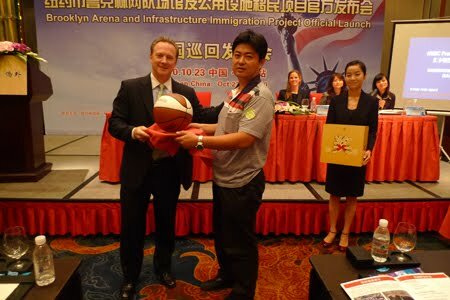 In July, the Guangdong Provincial Exit and Entry Administration issued a warning about the EB5 investment visa program stating that the projects are risky and advising migration brokers and potential investors to exercise caution when considering the large volume of EB5 visa regional center projects and investment immigration initiatives now being marketed. This doesn't mean that they were referring to the Brooklyn project. But China has become a fertile and competitive ground for regional center operators, which presumably invites more aggressive marketing efforts. 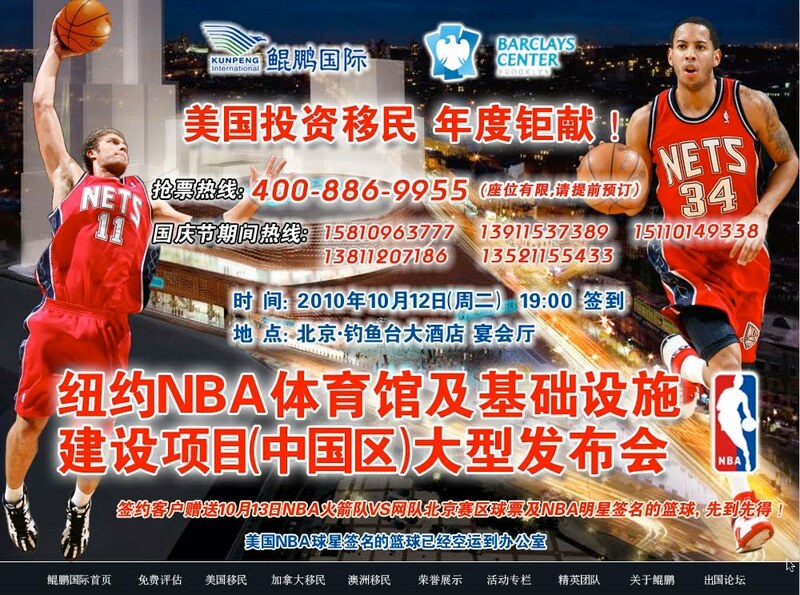 Within the relatively small EB-5 community, the Brooklyn Arena project has received more publicity than criticism. "Based on the publicity and promotional materials available in China, this project is very attractive and safe," commented EB-5 consultant Brian Su of the Illinois-based Artisan Business Group on this blog 10/11/10. Su's company will host an investor event next month in New York: Alternative Capital: EB-5 Opportunity, a New Frontier for Financial Industry. Next March, Wailian Overseas Consulting Group, a leading broker, will in Guangzhou host a two-day Invest in the U.S.A. 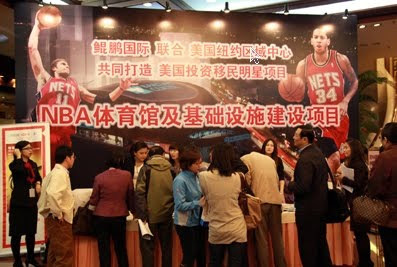 Summit, billed as "the largest EB-5 and US investment event in 2011." 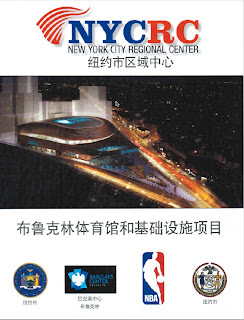 I received the NYCRC brochure via a source in China who got it from a session attendee. I believe it to be an original, complete copy but have not confirmed that; the information comports with other publicly available statements. The NYCRC letter to Markowitz and the USCIS letter to the NYCRC were received after a Freedom of Information Law request to Markowitz's office. 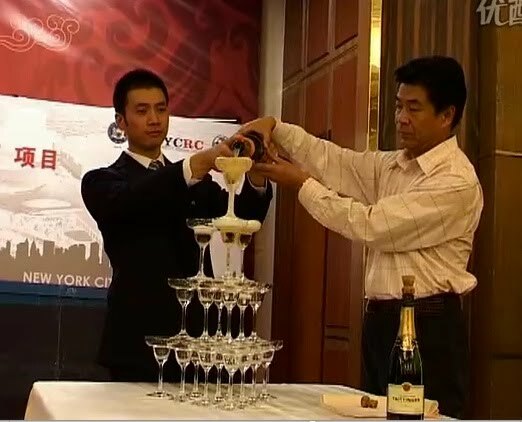 I listened to the NYCRC promotional video via an audio recording of a presentation to investors provided to me by Tom Spender, a reporter I engaged to cover an investor session in China. Spender also provided a few photos and less than a minute of video. 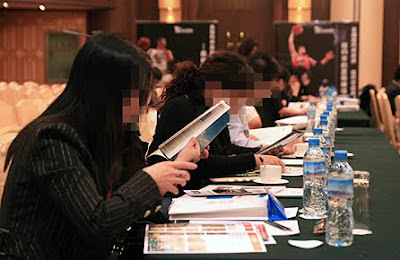 Spender, who approached the session promoters as a stringer for China International Business, covered the session for that publication as well as The National, a newspaper in the United Arab Emirates. Nearly all the video in today's post is edited from publicly available webcasts produced in China, which include promotional video and Q&A sessions. Hayden's statements in English, which appear in the original videos at various junctures, are edited into a single sequence but otherwise not truncated. Forest City Ratner; the New York City Regional Center, and the NYCRC's law firm, Miller Mayer, have ignored my questions about this EB-5 effort. A lawyer for the firm last month posted a shallow critique of an earlier Huffington Post article I wrote; here's my response. This is one of the most in-depth reports I saw!! Investors must conduct their own independent due diligence study prior to making any investment in an EB-5 project.